Dutch brewer Heineken hopes to increase its share in Russia, its single largest market, to 20 percent from the current 16 percent in five to six years, its chairman said Wednesday. “Our investment in Russia is a cornerstone of Heineken’s development,” Chairman Jean-Francois van Boxmeer told reporters, referring to the company’s 1.2 billion euro ($1.53 billion) investment in the world’s fifth-largest beer market since 2002. 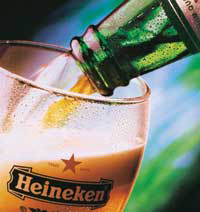 Heineken owns 10 breweries and is the country’s third-largest producer after Baltika, controlled by Scottish & Newcastle and Carlsberg, and InBev. A comparatively late entrant to the Russian market, Heineken acquired six local companies from 2002 to 2005, and now owns 36 out of the country’s 1,400 beer brands. “We have a very beautiful portfolio now,” said Roland Primez, Heineken’s chief executive in Russia, adding the firm planned no more acquisitions in Russia. Heineken, which produces local beers such as Three Bears, Ohota, Bochkarev and PIT, feels it is under-represented in premium brands, which make the highest profit, and is now pushing forward with licensed beers. It launched several premium beers, including an international version of Amstel, last year and will in a month start selling Budweiser under license from U.S. brewer Anheuser-Busch under the “Bud” trademark.